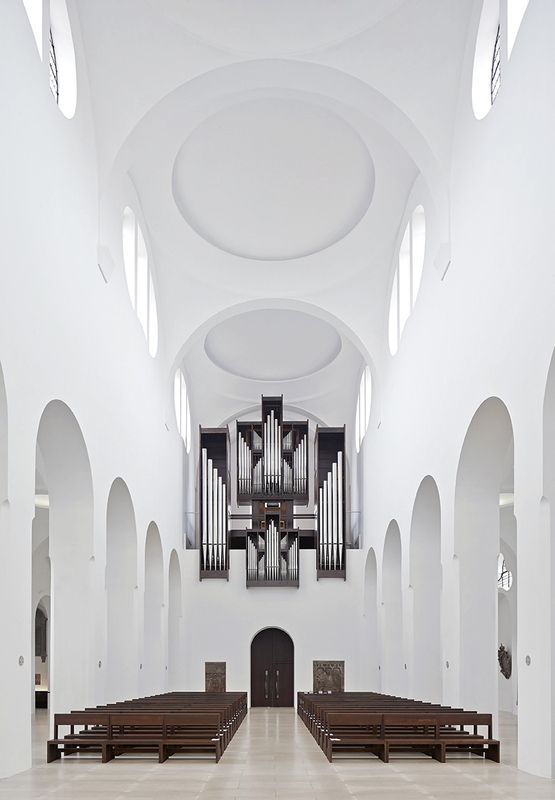 After surviving the traumas of devastating fires and wartime bombing, what's left of Augsburg's thousand year old St. Moriz (Moritzkirche) Catholic church has been paired-down and refined by beloved British minimalist architect John Pawson. 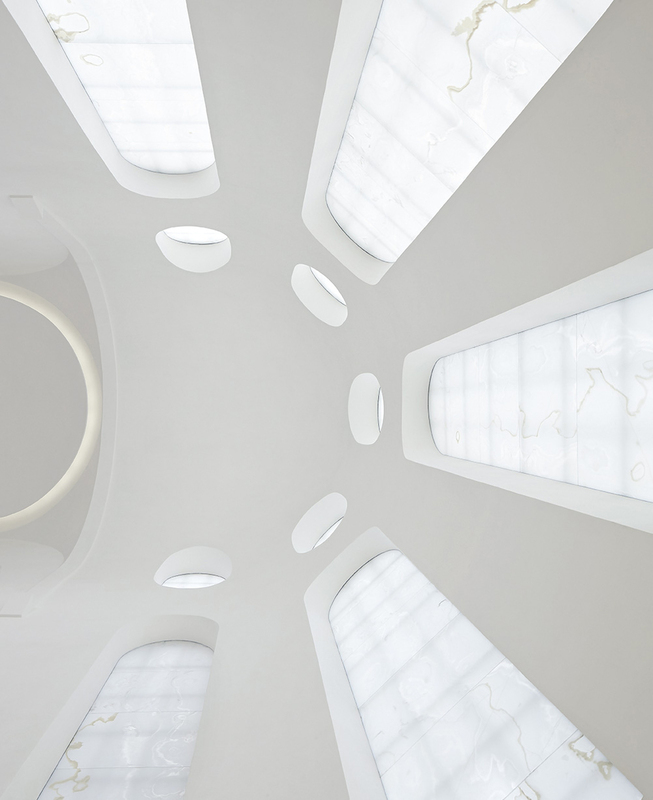 Pawson says that he approached the project as a "re-tune of the existing architecture from an aesthetic, functional and liturgical perspectives, with considerations of sacred atmosphere always at the heart of the project." The renovated church building is situated in Augsburg's historic center, right within a triangle formed by the Augsburg dome, Saint Ulrich basilica and Saint Afra church. Over the centuries, the church has seen various reconstructions and additions, leading to a conglomerate of style relics that have shed reference to their romanic, gothic and early baroque precursors. The impression of change, destruction and reconstruction has led to the decision to develop an integrative concept for the renovation of Saint Moritz. Pawson and his team, with the consent and encouragement of local Catholic worshippers, have stripped away much of the old interior, rearranged a number of artefacts, and lit the church in compelling new ways. In particular, the architect laminated a thin layer of onyx to the windows, diffusing daylight rays throughout the building. Pawson created an encompassing renovation concept for the church nave, paying tribute to the long history and tradition of the building while keeping in mind the needs of a modern community. With the help of Bion Technologies, the renovation included an innovative illumination concept blending harmonically with the building's interior features. This underscores Saint Moritz's unique architecture. Modern lighting technology was called for to provide the mild yet accentuated illumination intended by the designer. The new and predominantly indirect illumination provides full surface flooding as well as accentuated highlighting of individual building components, giving a unique impression of space, plastic shape and detail. All fixtures are concealed in architectural recesses to prevent blinding, yet ensuring a most natural lighting. Portuguese limestone lines the floor; hidden LEDs illuminate gloomy parts; certain Baroque elements, including the carved figures of the Apostles which look down on the congregation, have been retained. To no one's surprise, Pawson executed extraordinary control in drawing on existing forms and elements of vocabulary, an architectural language has evolved that is recognizable in subtle ways as something new, yet has no jarring foreign elements.